Jolon, CA, March 12, 2019 - Come to the pristine Valley of the Oaks and enjoy a step backward in time to the mission era. 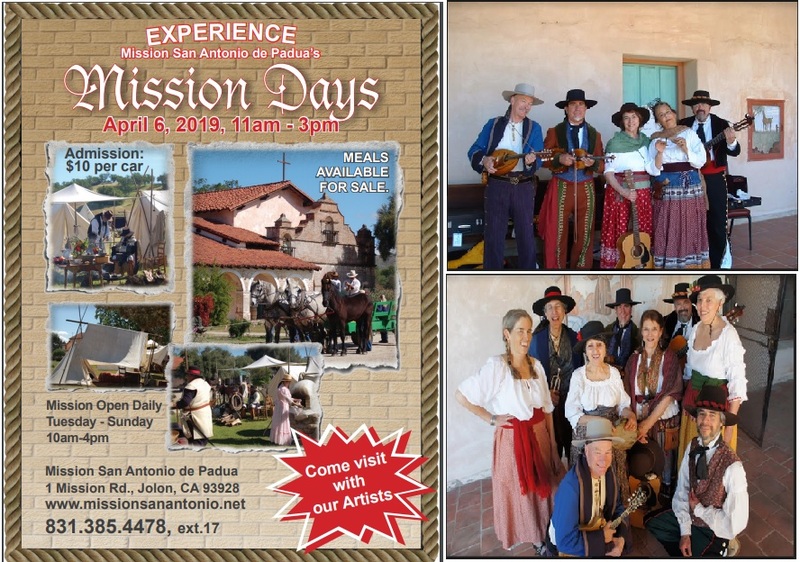 Attend Mission San Antonio’s annual Mission Days event on Saturday April 6, 2019, from 11:00 a.m. to 3:00 p.m. Parking and Admission is $10/car. Authentic mission era food will be offered for $10/plate with water and soft drinks also available. There will be historical re-enactors in costume portraying soldiers, artisans, vaqueros, musicians and dancers. Mission crafts and activities will be demonstrated, including weaving, blacksmithing, candle making, tortilla making, and much more. Members of Los Arribeños de San Francisco will be performing historical Californio music and dance from the Mission period. Artists will be present to display and offer for sale their original artwork. Mission San Antonio de Padua, the third oldest Spanish mission in California, was founded by Junipero Serra in 1771. The Mission is a state historical landmark and is on the national register of historic places. The Mission remains an active Catholic parish and retreat center. Mission San Antonio is surrounded by Fort Hunter Liggett, and is conveniently reached by publically accessible roads. The Mission is located off Jolon Road, at 1 Mission Road, Jolon, CA 93928. For more information visit our website at www.missionsanantonio.net or call 831-385-4478 ext.17.